An interview with Alex Haley by Ann Hawthorne six months before his death in February 1992. Haley discusses his impressions of life in Appalachia; the media image of Appalachia; reminiscences of his hometown, Henning, Tennessee; race relations in Appalachia; and his plans for future books. 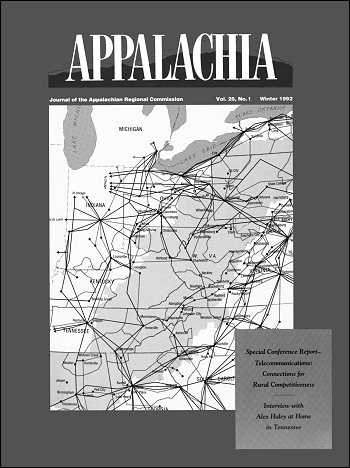 Included within the original interview, published in the Winter 1992 issue of Journal: Appalachia, are photographs and a eulogy by Bill Turner from his funeral. In his landmark novel, Roots, Alex Haley used fiction, which he later described as “faction” by stating, “Every statement in Roots is accurate in terms of authenticity—the descriptions of the culture and terrain are based on valid material” to trace the journey of his ancestors from Africa to the New World. And finally, in real life, Haley found his way back home to Tennessee. This interview was conducted by photographer-writer Ann Hawthorne in the summer of 1991 and scheduled for publication this winter. After forming a fast friendship with John Rice Irwin, founder and curator of the Museum of Appalachia, in Norris, Tennessee, Haley decided to settle nearby and bought a farm, now owned by the Children’s Defense Fund, from the Irwins. But Haley’s untimely death in February does not lessen the enduring message of his life, “Find the good and praise it,” as he himself puts it in the interview. Scholar and professor Bill Turner, who was a close friend of Haley’s, offers another perspective in the eulogy he has written to accompany the interview. Turner writes of a man who was loving, caring, giving and humble, a man whose impact on others was measured not only by his writing but by his quality of spirit. Hawthorne: Why did you choose to live in the Appalachian Region? Haley: I came to speak at the World’s Fair [in Knoxville, Tennessee, in 1982]. I had previously met John Rice Irwin [founder of the Museum of Appalachia] and Elizabeth Irwin in Nashville. When I came here for the World’s Fair, John Rice found out where I was staying. He came and picked me up and took me to the museum. And I was just absolutely captivated. I’ve always loved the expression “living history” and what it’s supposed to mean. That museum seemed to me more than any place I’d been around to symbolize living history. I just got captivated with the place. And then John Rice and I were sort of like brothers quickly. We’d find ourselves talking for hours on end. He’d jump in the car and we’d go up in the mountains and he’d point out this and that. And we would stop to visit people. I travel a lot. I lived in Los Angeles and I’d be going to New York or returning to Los Angeles. If I could I would drop off in Knoxville on the way and spend a day, two days, three, with John Rice. Eventually [the Irwins] offered to let me buy half of ten acres they had right across the road. I built a home. I didn’t stay in it very much. Finally John Rice bought a farm—the farm where I am now. They were going to subdivide it. They showed it to me. I said I needed 5 acres, then I needed 10, then finally I said 15. And John Rice said “Why don’t you just buy the [whole] damn farm.” And I agreed. I went over and he said, “Well, you needed one.” I was just thrilled to meet people like that. That’s not going to happen to you in Los Angeles. Not likely. Hawthorne: When you’re recognized in the community, how are you treated? Haley: They’re cool about it. They don’t make a big deal about it. You do get the little perks of special this or special that. It’s one of the nice things. Mostly I’m just treated like another neighbor. That’s the way I vastly prefer to feel. Hawthorne: Do you feel there is a distinctive character to Appalachia? Haley: That which is identified with Appalachia to me hyphenates with “distinctive character,” particularly I find [it in] the older people. Things that to me are singular, for instance, are the phrases. When I came here I’d never heard anyone say “Pap-paw” for grandfather. It was very graphic for me. I just find it all so identifiable with that which is called Appalachia. Hawthorne: How will this area be in 10, 15, 20 years? Haley: Well, I don’t really feel it’s going to be all that radically different. That’s one of the beauties of it. I don’t think it will be lost to greed’s over-building. I think it will remain identifiably this area. And not just in landscape. No, in its personality and the atmosphere—the way people come off here. That’s just my feeling. Hawthorne: What do you think about the public portrayal of Appalachia? Haley: I just see that most of what has come to be the large public view of Appalachia is what people who have had—and have—access to major media sort of created. They’ve created an image designed to say, “gee whiz, look at those odd people.” I am writing what I like to think is based more on fact—based more on reality. You know, there’s a thing you hear a lot that’s got some truth to it about how media tends to move toward that which is titillating—which makes fun of or embarrasses. Certainly regions lend themselves to that. Say, New England is stodgy, and proper and historic. But this area is not as defined and so it loaned itself to people poking fun at the hillbillies—the whole image that goes with hillbillies. That has been the pattern. Now people buy it outside because, one—they don’t know any better and, two—because it always kind of makes you feel better about the problems of where you are when you can chuckle while pointing at someone else. And that’s been true of the whole North-South thing. The North has chuckled and pointed at the South. Or if not chuckled, grimaced and said, “Hey, look at the things they do down there.” Well, the things they do are no less awful. But they don’t have the image as much as here. They’re not as vulnerable as the South is to the imagery on the part of big media. Hawthorne: Was storytelling a tradition within your family? Haley: No, that’s really a southern tradition. Most families generally had a storyteller within every generation. That’s particularly true of southern families. Hawthorne: Are you working on any now books? Haley: For a decade I have been not a writer. I have not been writing. I have been the author of Roots. And that I’ve got to change radically. I have so much stuff in my head and in notes. I would say five books. Each of which is along the way. In some cases very well along the way…. My problem has become simply permitting myself to be boxed into a corner where I don’t have time to write. I’m doing other things. But I’m about to cure that. Usually my choicest of all writing places is on cargo ships, but you can’t spend three-fourths of your life out at sea. I will go a couple of times a year just because I love to go to sea. And I write as hard as I can as long as I can stay awake. That’s how I do it. I don’t have set hours. I just work as hard as I can. I love to write. I really, truly do. A mixed blessing about Roots was that it was so big. It earned so much that it gave me the luxury of not having to earn for years. It’s a mixed bag, but it’s critical now that I write. And I am. There’s no question about that and I’m thrilled because I’ve got good stuff. And I say this because as a writer it is good, solid stuff. Hawthorne: Would you mind telling about it? Haley: Not at all. The first is a book of, not so much reminiscences of Henning, Tennessee, as it is of reflections upon that community when I was a boy growing up there. It’s principally about people who were there and the roles they played. Henning had then a population of 470—half and half racially—agricultural, sharecroppers. A little Protestant town. You were either a Methodist, a Baptist, or a sinner in any event. And what I write about is not so much the town in an overview way but the people within the town. The roles they placed. People who would seem so inconsequential in the city, but in a little town like that they [have] major roles. I think about things like, for instance: Saturdays were a big, big day for us. That’s when the “country people” came to town and Henning’s population might swell to 600 on a Saturday. Wagons, buggies, T-models, A-models—people bringing stuff from their farms to sell from the back of their wagons. Women’s heads in bandannas, men in overalls. The things that went on were just legion. Around 10:30 in morning the town square was one big, mingled aroma. Together with the noise of people talking and the cats and dogs, mules were stomping their feet and shuddering their skins to make the flies get off for a moment. You’d smell watermelons cut open down the middle by the watermelon vendors to attract you. You’d smell fried fish and then you’d smell fresh fish. That was Mr. Boyd that sold fish. And Austin with celestial barbecue…. All these smells just came together—it just transported you. It was our circus, our carnival every Saturday. I’m [also] writing a book about Appalachia, as a matter of fact. It’s centered around a grandfather here in Appalachia—a white grandfather. Most of the book’s characters are white. The one set of black characters is a blacksmith and his family. (I base him on a blacksmith shop over at my friend John Rice Irwin’s Museum of Appalachia that was owned by a man named Steve Parkey). In this book I want to try to convey that Appalachia is not the Barney Google, Lil Abner place that’s so popular in the public eye because of media presentation. I’m just kind of irritated by that image. The truth as I have come to know it is so very different. Here are a people with rich heritage, marvelous life style, atmosphere. I’m doing [another] book about what might be called, I guess, the other side of my family. Roots was my mother’s side of the family, which went into Africa. My father’s side, that’s the Alabama and the Irish side. That book opens in the Irish Revolution. It come down to a young man—a wealthy young Irish fellow who was kind of a flower child in his time. He broke with his father—broke violently—and became an immigrant, a wealthy immigrant to Philadelphia and Nashville. His oldest son grew up a well-to-do young man and went to Princeton. This was in the antebellum period. We don’t normally think too much of this now, but it was a time when the young men went to the slave quarters. And there were ensuing hundreds of thousands of progeny born. That’s a little piece of American history that is not often dealt with today—swept under the rug—not talked about. But it was as common as breathing was in that time. In this case, the young man eventually mated with the slave weaving woman, said to be an attractive mulatto, whose name was Easter. She bore a daughter named Queen who was as light as her father. After he married, Queen was assigned as the attendant for her half-sisters and they all grew up together on a big plantation. Of course she was kept slave. Queen was my grandmother, my father’s mother. Hawthorne: Did you know her? Haley: Oh, yeah. Sure did, She was white complexioned. She was little—brown hair, blue eyes, quick. They called her Cricket. And she was very proud of her complexion. My other grandmother remained very dubious about her—about her bragging about her color. It was just one of those things at the time. As a little boy it meant hardly anything. It’s a fascinating story. Hawthorne: When you are asked to speak, what is expected of you? Haley: I think largely what people ask is the author of Roots. And that may take many forms. I often speak about one phrase: “find the good and praise it.” It’s on every piece of stationery with my name. I saw it on a bumper sticker on a car in Los Angeles. And it so symbolized what I feel. I expect I have just sort of seized on that. It is, in essence: there are many problems; many, many difficulties we have in this country across the board, but if you travel a lot you become aware that we are much better off than most countries in the racial area. We have things which involve, as a rule, much verbal exchange. People get into arguments and there is all this rhetoric—racial rhetoric—going from the Klan to the NAACP and beyond. But if you go over and you see where people are literally killing each other for racial, religious or other reasons, it gives you another perspective. My thing is simply: let’s not exhaust ourselves dealing with the negatives. Let’s try to find a way to improve things. Let’s try to find a way to make it better. That’s what I mean by “find the good and praise it.” I really believe that. Hawthorne: Is this how you stand as a role model? Haley: Yes, it’s part of it. To say something positive. I would much rather try to solve a problem than just to repair a situation if I could. Most of what [young people have] heard has been negative. There were some nice young college kids—white and black—drawn together talking with me. And they admitted that their campus was so polarized that they had no way to even talk with each other. Hawthorne: Do you see that polarity in Appalachia? Haley: The percentage of blacks in this area is so small. That’s why you hear of as little racial problem as you do. That simply reflects the population. Haley: No, they don’t because that is superseded, if not drowned, in being black. Probably the most Appalachian man I’ve met is Bill Turner, a professor at North Carolina and also at Berea College. Bill is a scholar on blacks in Appalachia but I’ve never heard Bill refer to himself as an Appalachian. I think the most you would get from any of these people is that they would say they are blacks in Appalachia. I would say the same of myself. I’m not an Appalachian. I wasn’t born and brought up here. But I am a black in Appalachia—by choice. I’ve never heard a black refer to himself as Appalachian. And I know that what I’ve told you is why. If you deal with being black, you really don’t have the time to deal with being Appalachian. Haley: It’s a matter psychological. So many of us are enslaved by sundry things. You can be enslaved by a job. You can be enslaved by a marriage. You can be enslaved literally within a friendship if it binds you enough where you feel you cannot go outside the bounds of it. You will be struck dumb by the consequences of it. All these things go back to someone who does not have a sense of independence—a sufficient sense of independence. Most of us, if not enslaved, are mired in stereotypes. One of the things that really kind of intrigues me is stereotypes. There’s so much to-do being made over should black history be taught or not taught. It seems to escape most of our perceptions that what we’re talking about is American history. And I say that in a sense that we would all like to think we know American history because this is where we live. But the fact is—the hard fact—you cannot know American history if you do not know as much as possible about the components, the contributors to it. You can’t say you know American history if you don’t know anything about Indian history. And certainly not if you don’t know anything about black history. It has been such an extremely major component. And so it strikes me as so ironic—to use a good word—that we get such objections. That’s stereotypical—separating a facet and making that facet dubious. You see people go around here now since the Gulf Crisis bringing out the stars and red, white and blue. Many of them would be against black history. And yet they are wearing things that say “I care for American history.” One or the other is not totally true. My feeling is we all lose as long as we’re persistent in these kinds of points of view. I often tell young blacks, “You really need to know more about European history. Now these people just didn’t appear like fleas and multiply any more than our people appeared like fleas and multiplied. There was a history behind it.” This is a nation of immigrants. And what makes black people different—or African Americans—whichever we’re calling ourselves these days—is our ancestors were the only unwilling immigrants. But immigrants no less. Hawthorne: Do you feel you are free of stereotypes? Haley: Of course not. I don’t know if it’s possible. I know I’m not. To start with we all have prejudice. Indeed we do. And oftentimes it’s racial. It may be types of people. It may be personalities of people. In fact, I think somebody who had no prejudices, no hang-ups of this nature, would be somebody I wouldn’t want to get around. It would be like an oyster. Bland, just nothingness. No, I wouldn’t want to be around anybody who had no prejudice—who was so pure at heart that everybody was in truth the same. That’s not true. Just be honest, whatever you are. Just be honestly there. I feel we can get on a lot better if you’re just honest than if you’re one of the people who smile and tell me how much you think of me and my kind. And maybe don’t really do that. Hawthorne: What does this farm, this place mean to you? Haley: To have a place such as this to invite friends or to meet people who are not yet friends. I don’t do it just for others. It is in one sense a kind of southern hospitality. That’s not my motivation, but the way it’s used personifies southern hospitality, really. It’s a totally private place, self-maintained. The people who come here are a very wide range of people from all over the country. Recently we had people here from 35 other nations. O’ My people, listen to my teaching. Open your ears to what I am saying. For I will show you lessons from our history, stories handed down to us from former generations. I will reveal these truths to you so that you can describe these glorious deeds of Jehovah to your children, and tell them about the mighty miracles he did. For he gave his laws to Israel and commanded our fathers to teach them to their children from generation to generation. Through Roots, a deservedly celebrated work, Alex not only lionized himself; but, more importantly—surely to Alex—he captured the essence of the experiences of his beloved Country’s most visible though reluctant immigrants: Americans of African descent. Thus, from the moment that Omoro and Binta Kinte decided on the name “Kunte,” and ending as Alex Haley was lowered into the ground (spitting distance from the porch of his boyhood home, where his maternal kin told the stories to him), this world is a better place for the fact that he passed this way. I am a better person for having come under the canopy of this man; and in time, all thinking Appalachians will rejoice that Alex Haley chose the place we call home as his own final roots. He was “sure,” he once told me, that “my people passed through this part of Tennessee en route to Henning, I can tell!” Vintage Alex. Alex was fascinated by Appalachia, particularly as he saw it through the lens provided by the native eyes of east Tennessee (old) folk and through his connection with John Stephenson and the Berea College family. Appalachia, for Alex—a man with deep rural roots—became his surrogate twist on Thomas Wolfe: You can go home again. Lives of great men all remind us / We can make our lives sublime / And, departing, leave behind us / Footprints in the sands of time. Roots aside, all who really knew Alex Haley remember him most for his simplicity, his total altruism, his self-effacing humility and his keen sense of humor. No one should set out to try to do what he did, but there are a few things we can all do that would personify the qualities of the Alex Haley whose life I shared personally for some fleeting and precious moments. If all Americans could be as loving, and as giving, and as gentle to each other as Alex Haley was, then the Roots he gave us will not have been in vain. Thanks, Brother Alex Haley, and I know that God rests your beautiful soul. ~ Bill Turner. Bill Turner is associate professor of sociology at Winston-Salem State University in North Carolina and special advisor to the President of Berea College in Kentucky. He is also the founder of the Black Mountain Improvement Association.